Security cameras are use in a location where there surveillance is required. It can be your home, shop, office, god owns, etc. By putting these areas under surveillance, you are increasing the security of that establishment. For home or office purpose, normal security camera systems are used whereas high quality of camera systems are used in big commercial places, banks, jewellery shop, stores, etc. because chances of robbery are higher in these places. As the crime rate is increasing, numbers of houses and offices robberies are also increasing. Installing home security has become a necessity for all. You can hide these surveillance cameras in a tree or any secured location where no one can see it. In offices, the camera can be used to watch over any suspicious employee. Security cameras come with different features, sizes and prices; more feature means higher the price of security camera. Below are the list different types of these security cameras, which will help you in choosing what type and feature is suitable for you. Bullet Camera: These cameras are small and look like rifle bullet. They are suitable for both indoor and outdoor purpose. Hidden cameras: Hidden cameras are small and can blend easily in an environment if properly installed. Their main purpose to record from a hidden place so that the thief cannot see it and take counter measures. Motion detector camera: This camera only activates itself when any motion is detected by the sensors. This helps in saving the battery life of the camera. Night Vision: This feature is used to record anything in dark places. They can record clear pictures in pitch-dark locations as well. Wireless Cameras: This type of camera can carried anywhere because they don’t need wires to power themselves. They work on batteries, which make them mobile and adaptable. Now, you must be thinking, which brand provides the best camera systems? Don’t worry, I have created a list of top companies, which provide the best security camera systems. SONY: Sony is known for making best CCTV camera and high quality DVR’s for both office and home. Samsung: Samsung specializes in dome and infrared security cameras, which are used for capturing sharp pictures in low light areas. SVAT: They provide all types of high quality security cameras. Honeywell: They are one of the oldest companies in the security camera industry. Honeywell HD cameras are used to capture high quality image from hidden locations. Panasonic: They are well known for making high quality budget security products for home and offices. 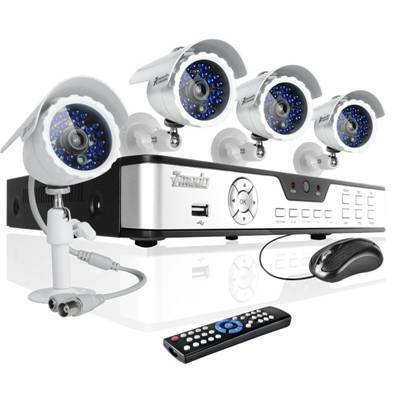 All the above companies provide high quality security camera system at different prices. After selecting the type, you can choose any company according to your budget and requirements.